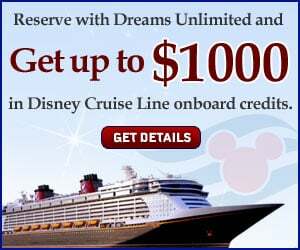 For some reason we’ve been talking a great deal lately about snack foods at the Walt Disney World Resort in Florida. Maybe it’s because with the cooler weather we’re heading into the parks more, maybe it’s because the restaurants are so full it’s difficult to get anything other than a snack or maybe it’s just because we’re foodies and we talk about food more than we should. In these conversations many staples get mentioned; the giant smoked turkey legs, Mickey Ice Cream Bars, pastries from Boulangerie Patisserie in the France Pavilion in Epcot, Frankfurter in a pretzel roll at Min and Bill’s Dockside Diner in Disney’s Hollywood Studios, the mini donuts at Typhoon Lagoon and the list goes on. With each discussion, and trying any new options my friends come up with, my mind always goes back to the Waffle Sandwiches at Sleepy Hollow in the Magic Kingdom. 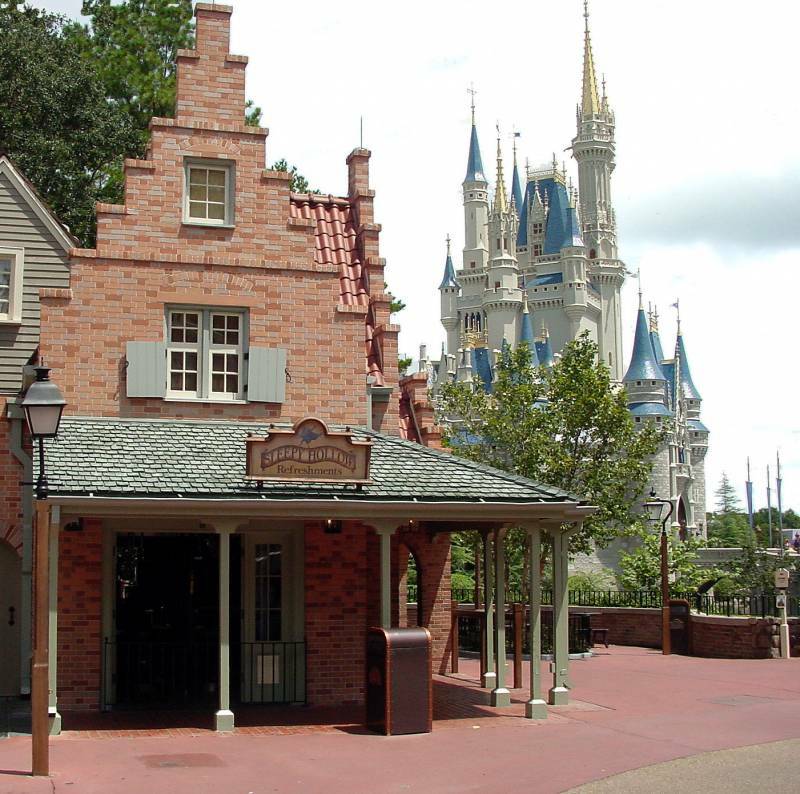 Just across the bridge from the main hub in the Magic Kingdom into Liberty Square you will find Sleepy Hollow immediately to the right. It would be easy to miss if it weren’t for the incredible smell of freshly cooked waffles hanging in the air. 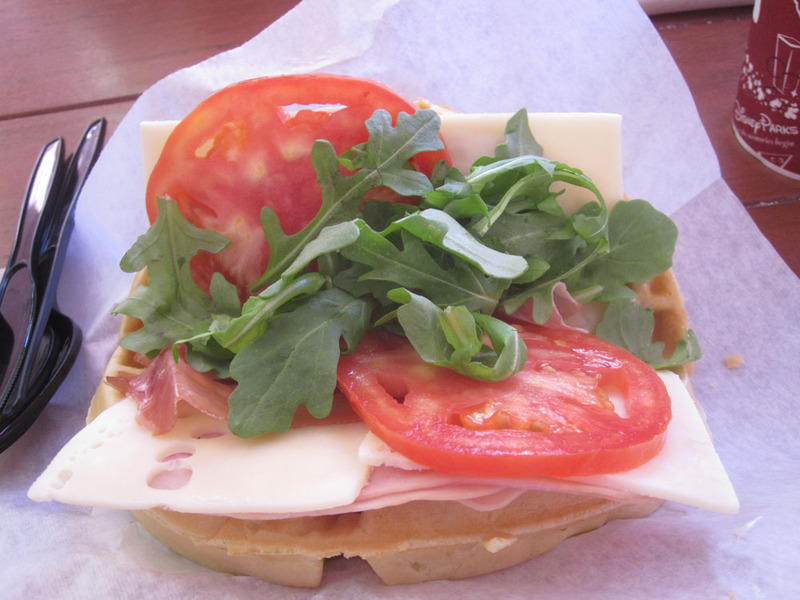 At Sleepy Hollow the hot-off-the-griddle waffles are not just served as a traditional breakfast item, they are also transformed into the most delicious sandwiches anywhere. 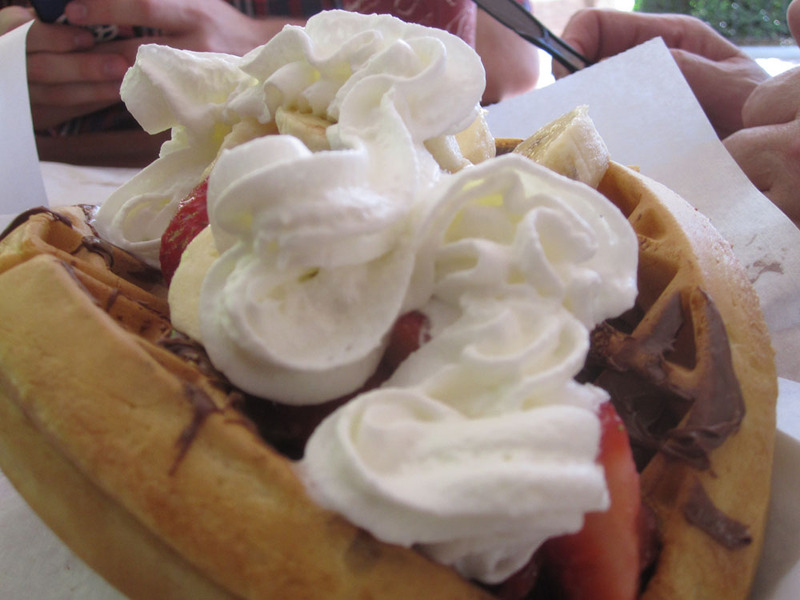 There are several ‘breakfast-type” waffle options available including; strawberries and whipped cream ($5.59), powdered sugar or cinnamon ($4.59). But the real star of the show here are the Waffle Sandwiches. The Nutella and fresh fruit waffle sandwich ($5.59) is an all time favorite and must be ordered with each visit to the Magic Kingdom. A crispy on the outside, soft and hot on the inside waffle is generously spread with Nutella and covered with mounds of fresh fruit. It’s gooey and messy and delicious!! 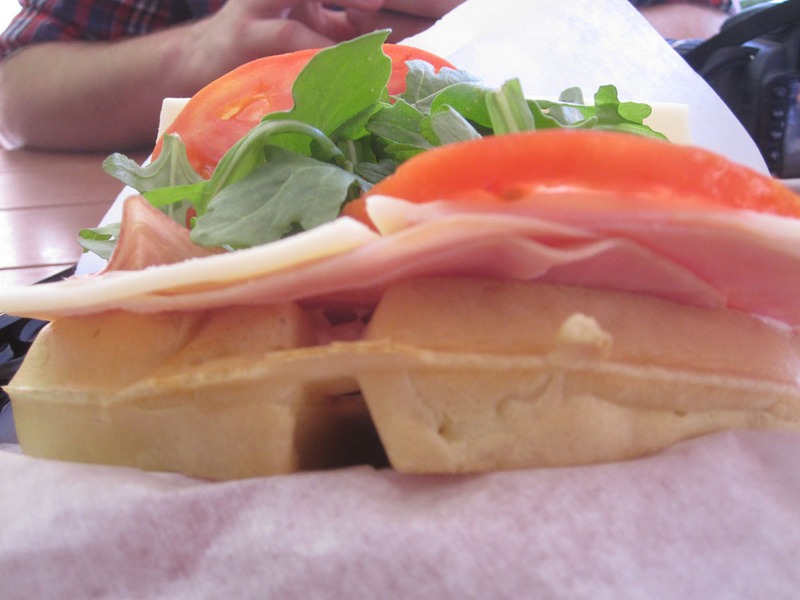 There are also two savory waffle sandwich choices; sweet and spicy chicken ($6.99) and ham, prosciutto and swiss cheese ($6.99). These are only available from 11AM to 5PM each day so make sure you time your snack attack just right or you might miss them. The sweet and spicy chicken is good but a little ‘watery’ for my liking. The juices run into the little waffle crevasses and form puddles – kind of creeps me out a little. However, the ham, proscuitto and swiss cheese waffle sandwich is incredible!! This ranks as my all-time favorite snack food at Walt Disney World. The warm, crispy waffle compliments the cool meats and cheeses perfectly. Folding the waffle into a sandwich seems odd at first but once you take a bite you’ll want to run out and buy a waffle maker and see what else you can put in a sandwich!! Topped with lettuce and tomato this makes for a well-balanced sandwich delivered in the most delectable way possible. Run, don’t walk, to Sleepy Hollow for one of these incredible snacks – and make sure you say ‘Hi’ to me as you might just find me there as well!! This entry was posted in Disney Food, Foodie Tales and tagged Best Snack Food at Walt Disney World, cinnamon, Disney's Hollywood Studios, Favorite Snack Food at Walt Disney World, Frankfurter in a pretzel roll, fresh fruit, ham, Liberty Square, Magic Kingdom, Mickey Ice Cream Bars, Min and Bill's Dockside Diner, nutella, Nutella and fresh fruit waffle sandwich, pastries, powdered sugar, proscuitto, savory waffle sandwiches, Sleepy Hollow, Sleepy Hollow in the Magic Kingdom, smoked turkey legs, strawberries, strawberries and whipped cream, sweet and spicy chicken, swiss cheese, Typhoon Lagoon, waffle, Waffle Sandwiches, Waffle Sandwiches at Sleepy Hollow in the Magic Kingdom, Walt Disney World, whipped cream by John Magi. Bookmark the permalink. 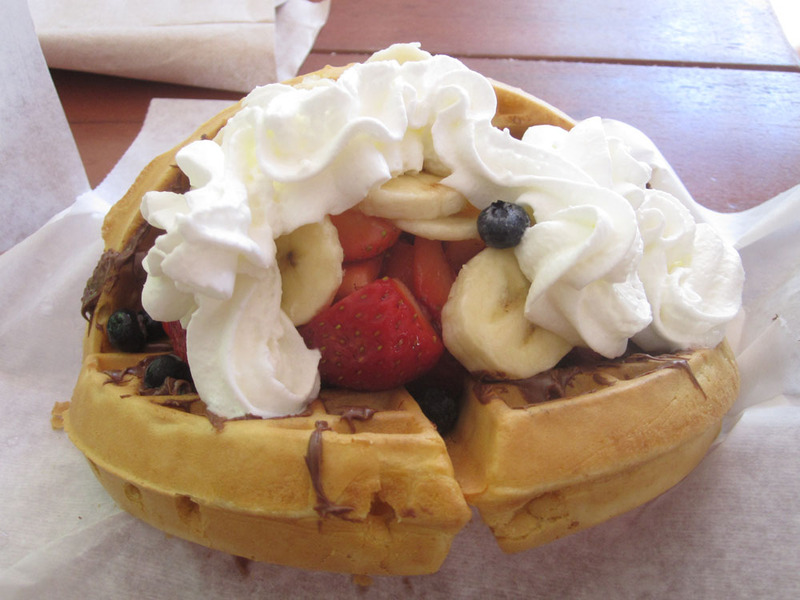 I cannot believe I have never had a waffle from Sleepy Hollow! I am trying that ASAP!! Thanks!